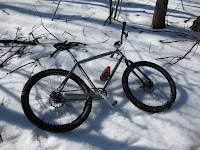 Four days after snow storm, time to ride Gamrbill? Maybe. The original plan was to ride Iceberg. I drove pass Mountaindale plowing limit and realized it was not a good idea to keep going up. Moved back to Hamburg lot and met up with Denis but the condition there wasn't any better. So Gambrill was the final destination. In short, I had to pedal most of the downhill and hike the up. A short 8-mile loop took over three hours and I went home half exhausted.